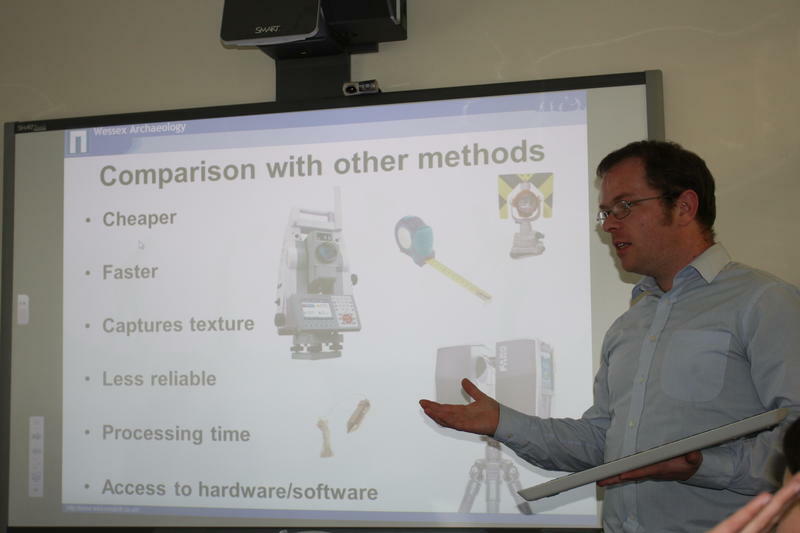 Wessex Archaeology is kicking off a programme of staff training in photogrammetric survey. This technique utilises high-powered computer software to combine hundreds, or thousands, of photographs into a fully animated three dimensional model. Photogrammetry ensures that not only is a highly accurate record made of our precious and finite archaeological resource, but we can also make these models available online so that everyone can explore the artefacts and sites investigated by our teams. By being able to rotate models on a computer screen, zoom in on certain features and apply filters, it is much easier to get a sense of the artefact. >Great strides have been made into the use of this technique for archaeology over the last few years and it is currently being implemented for both artefacts and whole sites as complex as entire shipwrecks, giving people access to heritage that is difficult to explore due to the practical limitation of getting underwater. As part of our continued commitment to innovation in heritage recording and staff development, John McCarthy, Project Manager from our Edinburgh office, visited our Head Offices in Salisbury to deliver training to our Coastal & Marine, Heritage and Central Services teams on 23 April 2015. Explore an interactive 3D model (below) of a find reported through The Crown Estate’s Offshore Renewables Protocol (ORPAD) on Sketchfab.